I recently realized that I have been attracted to just about every watch Angelus has released since 2015, when the revitalized brand reintroduced itself with a totally new identity. Now under La Joux-Perret (owned by Citizen), Angelus men’s watch has emerged as the more modern, flirting-with-futurism sibling of Arnold & Son. 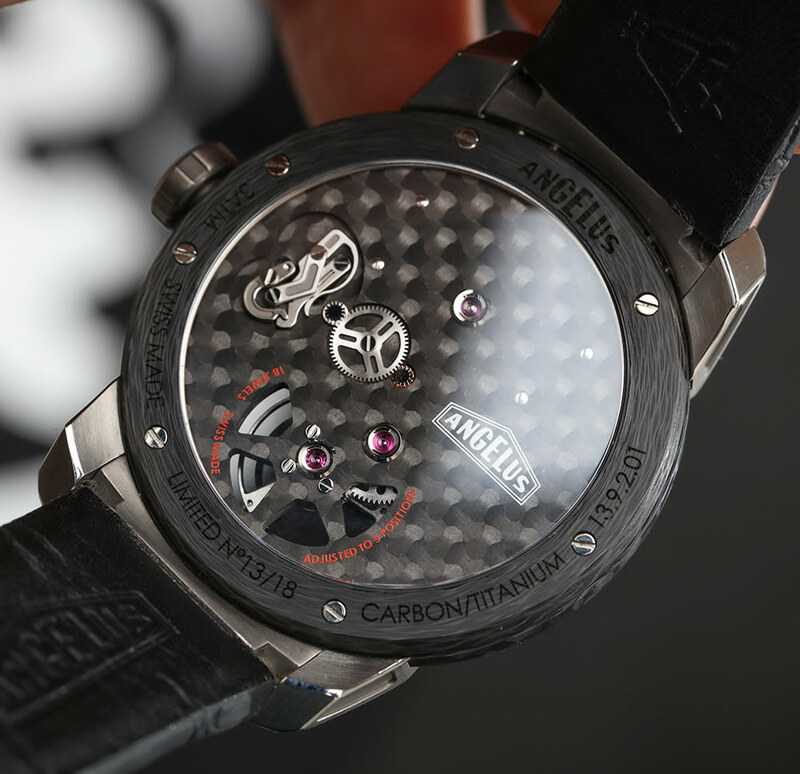 Announced at Baselworld 2017 came this pair: the Angelus U21 and U22 Tourbillon watches, which combine the brand’s aesthetic of totally viewable movements along with a full carbon fiber main plate rather than the sapphire main plate you might be familiar with from the U20 skeletonized tourbillon here. It makes for an overall lighter watch that foregoes the “see through” dial that might start to feel a little played out by the brand for a sportier and darker carbon fiber. The result is a mixed bag of a very cool looking watch that misses the mark with its case back and a carbon fiber pattern that will look “splotchy” to some. One thing I’m very happy about is the pricing (compared to the $70,000 U20 with the U21 at around $50k and the U22 at around $38k) but also a desire for something new that’s not a tourbillon. Perhaps even a true “affordable” non-tourbillon, though production cost factors might keep that from being a reality at the moment. Maybe I’m just a little tourbi-over it right now (sorry). Before I get into the differences between these two models, we’ll start with what the Angelus U21 Tourbillon and U22 tourbillon have in common. 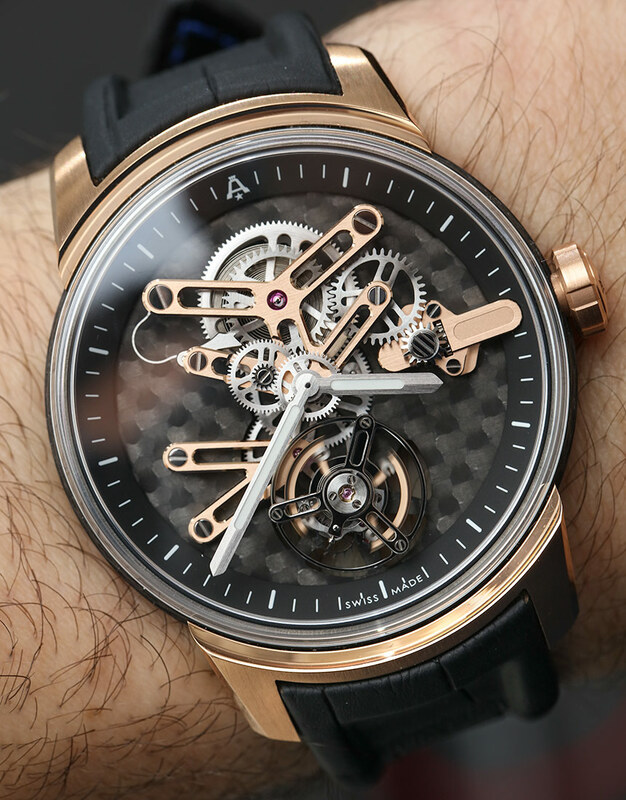 Obviously, the movement is the same with both models powered by the Angelus A-250 Caliber which operates at 3Hz and has a 90-hour power reserve. Everything is hand chamfered and polished, and though some of the movement on the U22 blends into the carbon fiber main plate (a little too much for my taste) the intention of showing off the wonderfully minimal movement succeeds here. Where things go wrong, however, is the case back. Where the U20 (especially the fully see-through model) had a case back that was as fascinating to admire as the dial, these models fall flat. The challenge of making the carbon fiber main plate succeed on the dial and case back isn’t lost on me, but the case back just looks like an asymmetrical and random assortment of movement bits and text. 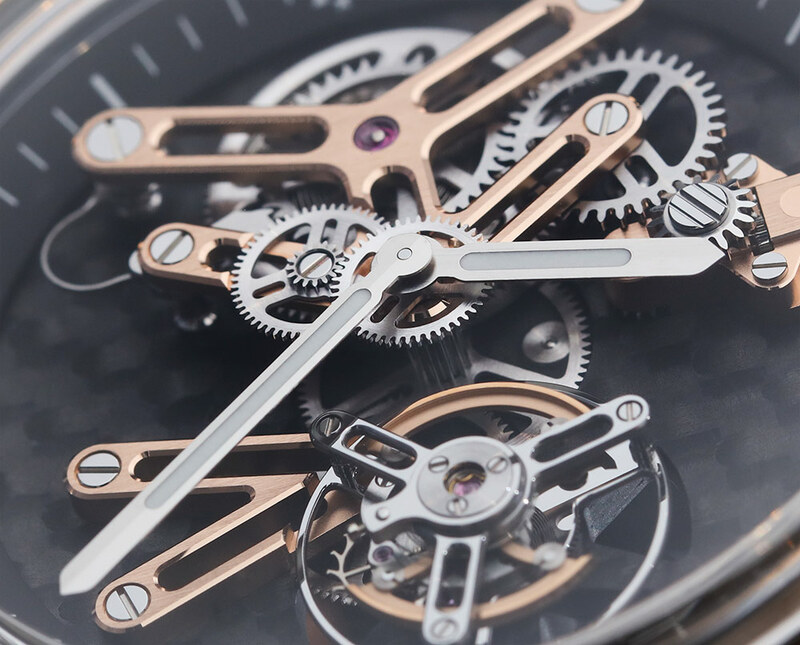 It just doesn’t work, but fortunately the part of the watch you’ll spend more time admiring makes up for this.